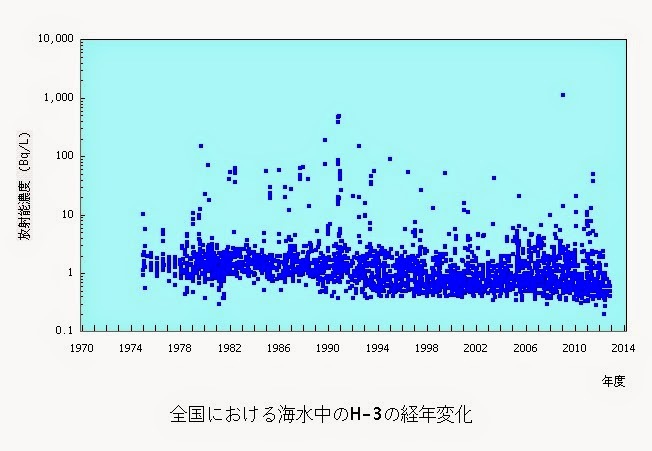 There appear to be no historic levels measured for Strontium, Cesium, or any of the hundreds of other radionuclides produced by nuclear fission. And it looks like they are finally taking note if what I put in twitter a couple of months back about monitoring tritium levels in preparation for what might hit the US northern sea boards, and have cooked the books again! The world is watching you, you start lying to me and the rest of the world and I will shame you to the world. 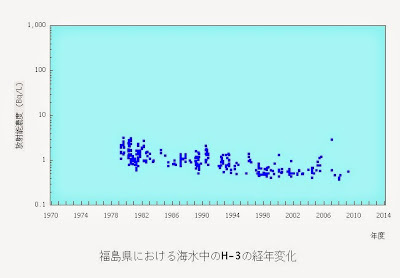 The previous measurements of groundwater are still up on the Tepco site. Total beta sources were measured at over 900k in one location. They are taking measurements at a number of locations, and the location mentioned in the story today is different from where the high measurements were taken in October. Tsuruga is where? at the tip of the peninsula or deeper in the bay? At that level of activity there's no anomalies in ocean life? 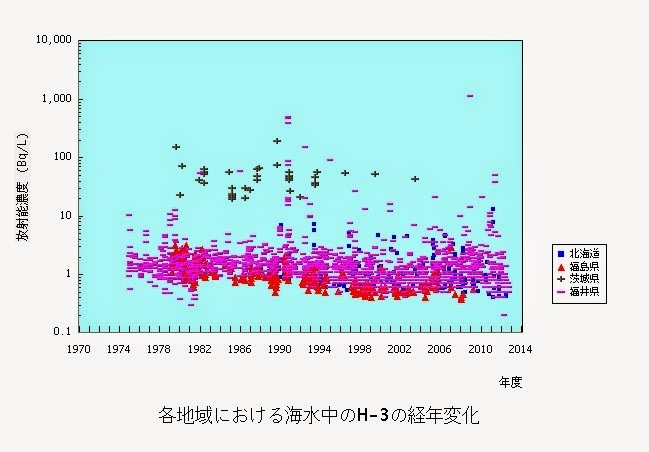 "1100 Bq/L of tritium was measured from .. Tateishi. Tsuruga Nuclear Power Plant is located nearby." It looks like either a one-off event, data transcription error, or measurement error. 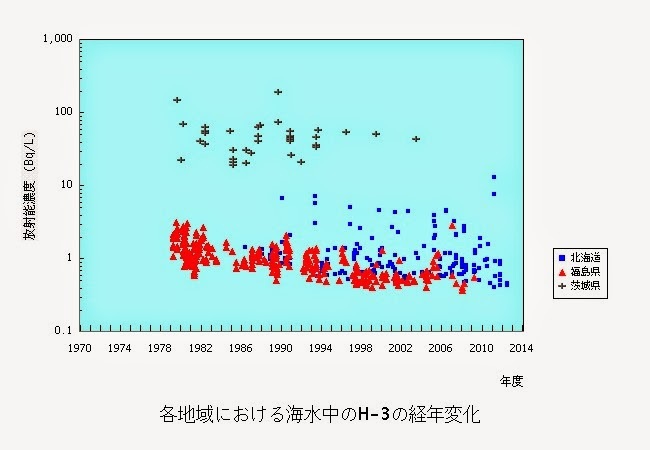 Legal limit for tritium in water released from Fukushima I is 60000Bq/L. Tsuruga has a boiling water reactor and a pressurized water reactor, so the limit may be higher. (PWR releases more tritium.) 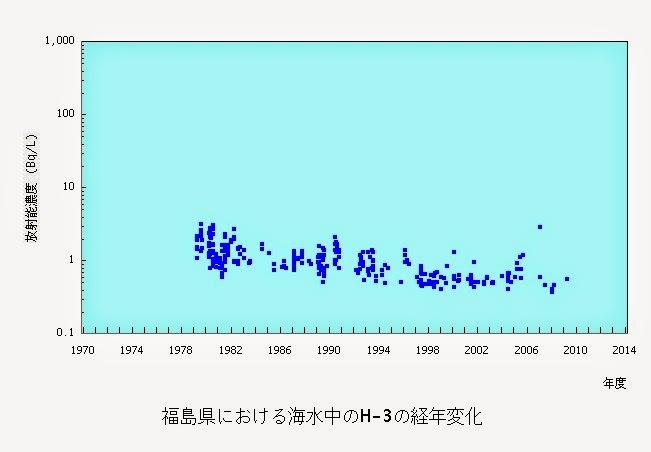 The limit is for the exhaust water from the plant, not for the seawater. I'd found Tateishi on google but was wondering where Tsuruga itself is. 1100 Bq/L must be like mouthwashing with hydrogen peroxide solution? Don't be silly. Canada's limit for tritium in drinking water is 7000 bq/l. Australia's limit is 76,000 bq/l. The World Health Organization suggests a limit of 10,000 bq/l. Hate to use the cliche "Google is your friend"... but sometimes its true. Can you publish similar charts for Strontium-90? Particularly the 2011-2014 readings - thanks! Anon at 8:07PM, do it yourself. "Hate to use the cliche "Google is your friend [,absurd, and incomplete]"... but sometimes its true." In this later days of post-industrial apocalypse, search engines like googlemaps, when queried for Tsuruga do not tell you where it is .. because it's important to assist information control like the fantasy that creatures that take their oxygen from the waters they swim in are unaffected by internal doses of that much tritium. Commissioner Shimazaki (an earthquake scientist) assessed a few npps to be on top of active faults therefore their review stalled. According to a member of the Parliament that belongs to the pro-restarts LDP the replacement of commissioner Shimazaki is tailwind in favour of the restarts. Tepco should never have been entrusted the operation of nuclear powerplants. "Tepco should never have been entrusted the operation of nuclear powerplants." That became obvious after the big quake on the west coast of Japan. Then the Japanese govt. chose not to seize the company after Fuku. The Japanese govt. should never have been entrusted with the nation's welfare. An island nation ringed with defective nuclear plants.